We are pleased to announce that our July sale #317 is filled with a great variety of interesting and valuable material. The covers section is highlighted by a beautiful U.S. #2 on cover. There are many U.S. and WW cover accumulations including FDCs, topicals, special events and more. There are a number of lots featuring WWII correspondence from governments in exile, concentrations camps, internment camps and solider mail. 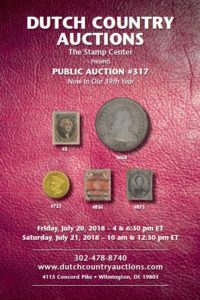 In our U.S. section there is a very fine #72b, the largest known multiple of #73, a scarce block of #76, #154, nice Columbian dollar values, #293 NH, E5a, J3, O70-O71, PR30 and much more! Following the single items are many U.S. collections and accumulations. The coin section features a nice 1797 bust dollar and a very attractive 1874 $3 gold coin along with many others. The worldwide section is just bulging with value; from single items like Queensland mint #74-78, Bechuanaland #68a (only 8 known), Canada #2 w/ cert, China 1095a, PRC 943a, 948a, France B10, Germany 102 and a host of other great accumulations and collections. Much to choose from!